Eurobridge Specializes In Value Add Property Investments In Central London Growth Areas. The boundaries between companies in London’s Square Mile and the tech start-ups of adjacent Shoreditch used to be clear. Not only were they geographically distinct but the two tribes were identifiable by their dress codes, office decor and architecture, and the commercial rent they paid per square foot. 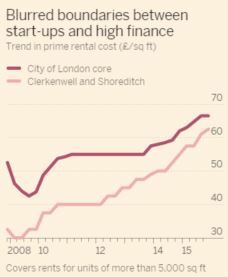 Today, the lines are blurring as start-ups and technology companies press south towards the City of London, because of near parity in rents and an undersupply of space in Shoreditch. At the same time, law firms, banks and other traditional City businesses are adopting the office layouts and working styles of their new neighbours in the hope of fostering innovation, impressing clients and recruiting younger workers. In the City’s Finsbury Square, two new property developments have co-working spaces for start-ups. One, 10 Finsbury Square, is home to Runway East, a 13,000 sq ft open-plan space occupied by 17 start-ups and dominated by an indoor croquet lawn. Nearby, Huckletree is a co-working space for start-ups at Alphabeta, the newest development on Finsbury Square. It has not yet opened and is oversubscribed. “It’s not just start-ups. A lot of City firms want to house their innovation teams there,” says Huckletree co-founder Gabriela Hersham”. In 2012, the City of London offered reduced rates to bring co-working spaces such as Google’s Campus London and Central Working to the City’s fringe on Bonhill Street, but nothing influences tenants like scarcity of space and the emerging parity of rents. “There’s not a lot in it any more,” says Juliette Morgan, of Cushman & Wakefield, a property consultancy. 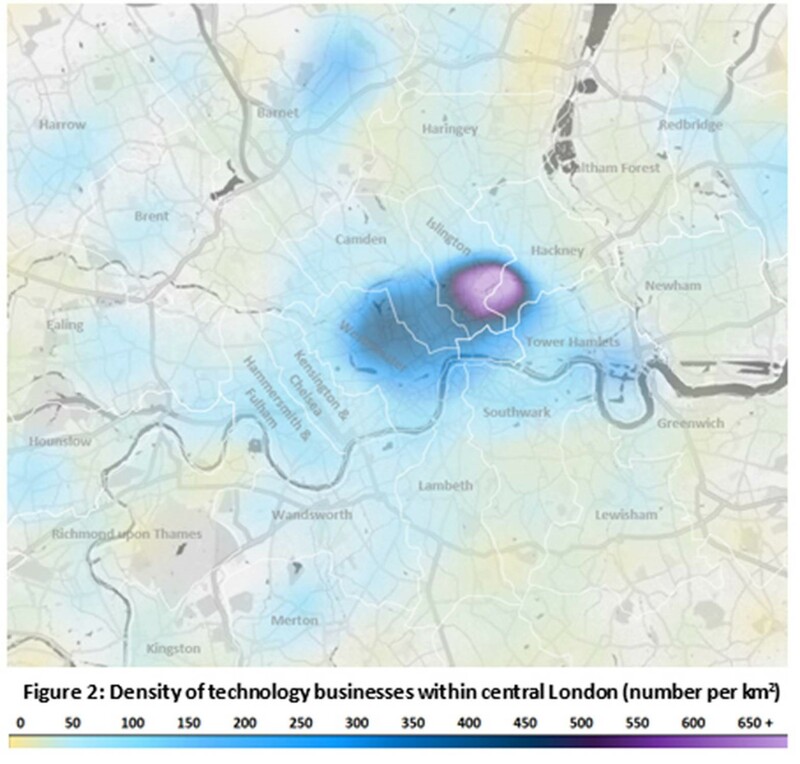 “There are buildings in Shoreditch at a lower £60 per sq ft and buildings in the City in the top £50s.” If rent and office supply account for the tech companies pressing into the City, what accounts for City companies adopting the start-up aesthetic of their new neighbours? As providers of co-working space such as TechHub and WeWork move into Moorgate and Bishopsgate the exposure of City workers to such environments has risen. “Investment bankers see friends wearing jeans, working in laid-back offices with yoga studios and that’s what they want,” says Tushar Agarwal, who left an investment banking job at Greenhill & Co to set up office sharing company Hubble. 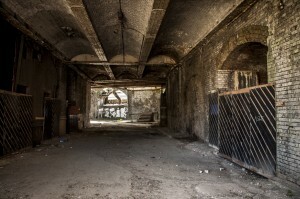 In a reverse of the southward flow of start-ups, City firms are moving closer to Shoreditch. Ms Morgan says one of the first occupants at Alphabeta was a law firm that wanted to project a slightly edgier image to clients and staff. This desire has served the operators of co-working spaces well. Fresh analysis of official data shows that in more than half of London’s postcodes, the average property now costs in excess of £500,000. This includes areas such as Peckham — the home of fictional sitcom family the Trotters — and the East End, until recently better known for its high unemployment rates than for its luxury homes. “The wave is building outwards and eastwards,” said Andrew Bridges, managing director of estate agent Stirling Ackroyd, which commissioned the research. London was “increasingly another country”, he said. 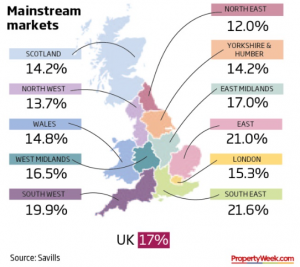 While the prime London market has slowed following the changes to the stamp-duty system in late 2014, the new research shows how prices that would be considered top-end in most other parts of the country have spread to large swathes of the capital. The average property in England and Wales costs less than £200,000, but of the 156 postcode areas where average prices are more than £500,000, 141 are in Greater London. The figures are based on analysis of Land Registry data — which captures the actual selling prices for properties including those bought for cash — and then adjusted to be representative of an average property in each area. 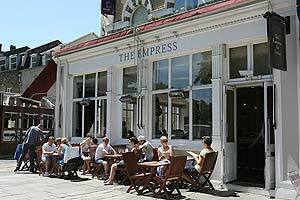 The east and south-east postal areas, which include places such as Limehouse, are the only traditional inner London postcodes where average values remain below half a million pounds. With the average London salary standing at approximately £34,000 a year, that means more and more areas are moving out of reach for ordinary workers: the average London home costs nine times the median income for a full-time worker. Last year, Deloitte became the second big employer to help junior staff with the struggle of living in the capital, reserving flats to rent to more than 40 of its graduates at the former Olympic Village in Stratford, east London. There is little cheer for would-be homebuyers in predictions for the coming year: the Royal Institution of Chartered Surveyors said its members expect house price growth of 5 per cent in the capital in 2016. That represents a slower growth rate than last year’s rate of almost 10 per cent, but rapid growth rates have also rippled out to commuter towns such as Reading. House prices are expected to rise by 17% on average across the UK over the next five years – so long as mortgages rates do not rise above 4.5%, according to Savills. 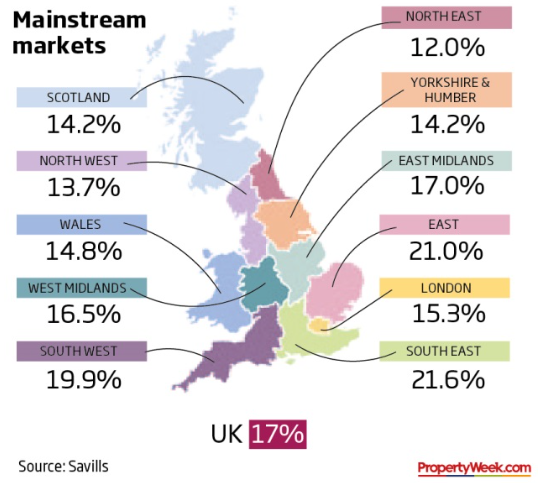 The agent’s latest residential forecast said the growth would be driven by a rise of 21.6% in the South East and 21% in the East of England, with the mainstream market in London expected to post a rise of 15.3%. Cook said recent mortgage regulation, which had introduced stress testing for affordability, had capped the amount people could borrow relative to incomes and would rein in runaway price growth. “That is likely to cap price rises, particularly in London, where house price to household income ratios are highest, thanks to growth seen over the past 10 years,” he said. The report also showed prime residential markets were set to enjoy solid price growth over the next five years, driven by a forecast increase of 24.5% in suburban London. 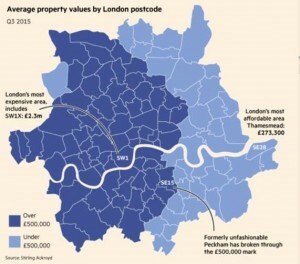 Savills said lower value outer London boroughs had greater capacity for house price growth than the higher-value parts of the capital, having grown in line with the South East and East of England, rather than London itself in recent years. Walthamstow and Lewisham were expected to show the strongest growth, outperforming the mainstream submarkets of areas such as Hammersmith & Fulham and Richmond. The UK must build a minimum of 220,000 homes a year between now and 2031 to keep up with household growth projections, according to the Town & Country Planning Association. Current housebuilding levels deliver just over half that number, meaning further upward pressure on prices and rents if supply does not increase. How Many Homes, a project commissioned by the TCPA, found that housing requirements are lower than expected – because young people can’t afford to buy or rent on their own. Even if the target number of houses are delivered, the research suggests that couples aged between 25 and 34 will be less able to live in their own home than their counterparts in 2011. Kate Henderson, chief executive of the Town and Country Planning Association, said: “While it looks as if the projected number of needed homes has dropped, this is because many people now can’t afford their own home – either to rent or buy – and are living with parents or other people longer than they would like to. Financial services companies increased the amount of London office space they occupy by 85 per cent in the first half of 2015, a sharp acceleration that put more pressure on business rents. Companies including Investec, Deutche Bank and the hedge fund Marshall Wace leased extra space for their growing London operations, according to research by Cushman & Wakefield, a property adviser. Prime central London office rents had risen 10 per cent this year to a record £66.50 a square foot, exceeding pre-crisis highs, said C&W, which added that prices would keep rising in 2016. More than 2m sq ft of additional office space is expected to become available in the City financial district by the end of 2017. But much of this was pre-let, said Elaine Rossall, head of central London research at C&W, and so would do little to ease supply constraints. Meanwhile vacancies in the West End have reached historical lows. This has prompted a “migration to the east”, with about half of companies vacating West End offices moving to the City or further east. Before the latest rapid expansion financial services increased office space by 46 per cent in 2014 after a 7 per cent decrease the previous year. Expansion by financial groups in absolute terms exceeded even that by media and technology companies, whose combined office footprint grew 97 per cent in the first half. Companies that were already in central London increased floor space by 56 per cent to 5.3m sq ft. The average price of a London home has hit £500,000, according to the Land Registry, rising 10 per cent in the year to September. In England and Wales the average selling price was £187,000, up 5 per cent on a year earlier, underlining the big and growing difference between London and the rest of the country. The only area not to see a rise was the north-east, where prices fell 0.3 per cent to just under £100,000. Increases have rippled out from the capital, with prices growing 9 per cent in the south-east and 8 per cent in the east of England. “With the prospect of an interest rate rise likely to be pushed deeper into 2016 by [Tuesday’s] underwhelming GDP data, house price inflation is unlikely to be checked by a rise in the cost of borrowing,” said Jonathan Hopper of Garrington Property Finders. With demand up and supply stagnant, London prices look set to keep rising. The capital’s population hit a record high in the past year and is forecast to rise to 10m by 2030. Housebuilding at the rate of 50,000 is estimated to be required to meet this demand, but only about 19,500 a year have been built during the past decade. Brandon Lewis, the housing minister, last month said he wanted to see 200,000 homes built each year by 2020. Last year just 140,000 were built. The median salary of a London worker, as of April last year, was £33,800 or £650 a week, according to the Office for National Statistics. With a deposit of six months’ gross earnings and a mortgage of four times income, the median worker would only be able to raise 30 per cent of the price of the average house. At the top end of the market, the figures illustrated how higher stamp duty levied on sales of the most expensive homes has slowed down activity. There was a 22 per cent fall in sale volumes for homes worth more than £1.5m in July compared with a year earlier. Stamp duty reforms introduced in December last year led to a reduction for all but the most expensive properties. The duty levied on a £2m home went from £100,000 to £153,750, leading to many buyers seeking lower prices that sellers have been reluctant to accede to. “There has been nothing less than a shakedown at the super-prime end of the property market,” said Rob Weaver of crowdfunding platform Property Partner. House prices would rise 6 per cent next year, IHS Global Insight forecast, helped by “very low mortgage interest rates, strengthening earnings growth, high employment and elevated consumer confidence”. East London’s ‘Silicon Roundabout’ is home to a greater density of technology firms than any other location in the UK, from Manchester to Glasgow – and hosts 70 times the density of tech firms in Cambridge’s world-renowned hub. 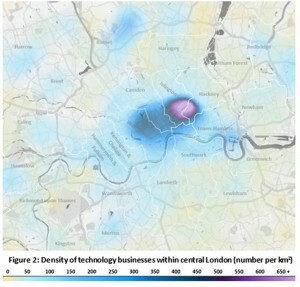 Hosting 3,228 tech firms per km2, it is little surprise Silicon Roundabout wears the tech crown with London only hosting 58 per km2 across the capital on average. Even its closest competitor nationally, the Manchester Mill tech postcode, has 412 per km2, and its nearest rival in London is only the other side of the roundabout in the EC2A postcode at 1,580 per km2. Andrew Bridges, managing director of Stirling Ackroyd, comments, “At the bright heart of Britain’s technology industry, there’s an entrepreneurial startup spirit to the Old Street area that’s creating its own gravitational force. Social media is the Bloomberg of the 21st century, HTML is our new lingua franca, and Shoreditch is fast becoming the Canary Wharf of the 2020s. These Londoners who have made their home in the East have benefited from a comparative affordability of these tech hub areas. An average residential price-tag of £846,000 for a WC postcode stands 20% higher than the equivalent in East Central (EC) postcodes. Even more locally, the Old Street and Shoreditch areas are much more affordable than even their closest neighbours. As of Q2 2015, property prices average £703,000 across the ‘EC’ area, including the City of London. But around the Silicon Roundabout, prices in Q2 started from a considerably more modest £508,000. Only marginally further afield, purchase prices for a one-bed flat in ‘E’ postcodes of the wider East London area (comprising areas such as Hackney, Dalston, Clapton and Stratford) average just £373,000. House prices in the capital are set to outpace earnings for the foreseeable future, despite government efforts to boost house building and affordability. Average London asking prices have jumped to £613,922 – above £600,000 for the first time ever – according to Rightmove data published today. It marks a rise of 5.8 per cent compared to a year ago and was helped on by high-end properties returning to the market after the General Election result quashed fears of a mansion tax. “There is no doubt that London is woefully under-supplied, and this will prevent any significant price falls,” Lucian Cook, a director at estate agent Savills, told City A.M..
Part of the reason may be a lack of house builders. “When the crisis struck, a lot of small and medium sized house builders went out of business,” Dame Kate Barker, a former UK rate-setter and current board member of building giant Taylor Wimpey, said. House building in London is on the climb after a torpid few years, says Neil Jefferson, a director at the National House Building Council – but not by enough to satisfy demand. Another suspected constraint on building is the planning system. 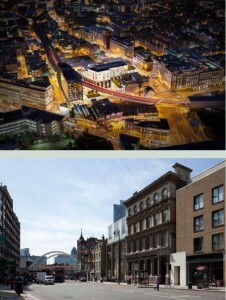 “The biggest supply constraints are to do with the planning system – both within London and around it. Constraints within London include density and height restrictions, and are administered at the borough level; constraints around London are primarily caused by laws that protect the Green Belt from development,” said Sam Bowman, deputy director of the Adam Smith Institute. But price growth is unlikely to reach the sky-high, double-digit rates it reached last summer. Estate agents say that demand is being suppressed by strict mortgage regulations introduced last April, and December’s stamp duty changes, which increased the tax on home sales over £1m. Office availability in central London fell 3% in the first quarter of 2015, dropping to 10.8m sq ft for the first time in 14 years, according to CBRE. A report from the agency found the start of 2015 has also seen the strongest first quarter take-up of office space for five years, with 3.1m sq ft transacted between the start of January and end of March. Emma Crawford, managing director, central London office leasing at CBRE, said: “Demand for office space in central London has been strong, and when coupled with slimmed down supply, it’s only natural that we’ve seen rental growth almost across the board. 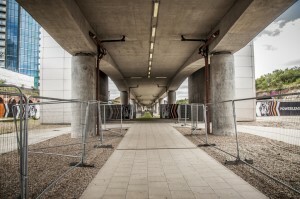 Crossrail’s high-speed rail service will not only provide millions with increased connectivity into the capital, but it will send house-prices along its route skyrocketing. 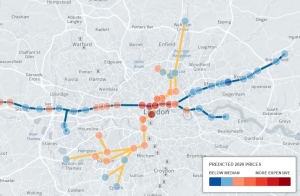 The £15.8bn Crossrail project has already had a profound effect on properties in London. The prices of those near the large-scale Tottenham Court Road development have increased 439 per cent in the last decade. Houses in the same postcode as Crossrail stops in Burnham, Maidenhead, Taplow, Langley and Slough will jump 60 per cent in value, with prices expected to increase by up to £160,000 in the next four years. For those on the hunt for a profitable investment, house prices on the opposite end of the Crossrail route, in north and south-east London, will be the most affordable in 2020. 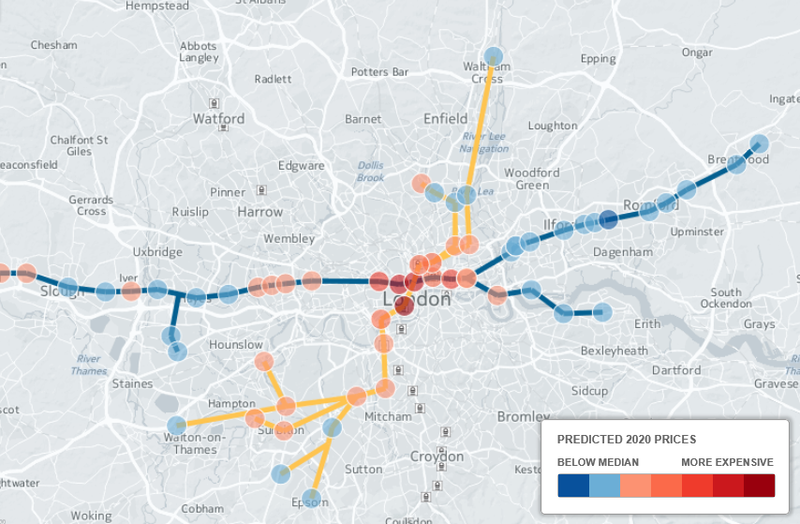 The dark blue line running from east to west is the Crossrail 1 development, due to be completed in four years, while the yellow line running north to south is the proposed Crossrail 2 route which would not be completed until at least 2030 should it get approval. Properties near the Southall, Chadwell Heath, Woolwich, Romford and Shenfield stations will be the best for those looking for an affordable property with a high-speed rail network on its doorstep. “Demand for offices has not been above 3m sq ft since Q3 2000, and, at this level, is nearly double the long-term average of 1.7 m sq ft”, “today there is a new optimism surrounding the office sector. Many employers want their staff to come into the office, so they interact with colleagues and generate ideas” Knight Frank. The London suburbs outperformed the capital for the first time since the credit crunch, recording growth of 5.7% in the first six months of 2014, compared to the prime London average of 4.9% according to Savills prime index. It amazes me how ironic life is at times. While out working on a documentary about the failure of economic regeneration in East London post Olympics, I bumped into a nice chap called Tomasz, from Soundings Office. He was as eager as a schoolboy with a new toy to explain to me what was happening in the vacant lot opposite Shoreditch High Street Station. Both killing my photography project and piquing my curiosity, Tomasz pointed out that the vacant site, now filled with football pitches, is currently being redefined with the help of local businesses and residents, an undertaking that will significantly alter the landscape of the Shoreditch area. 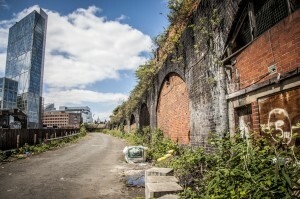 The Goodsyard, formerly known as the Bishopsgate Goods Yard, is nestled in the middle of Shoreditch, Banglatown and Spitalfields. 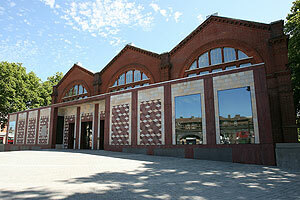 It encompasses Shoreditch High Street Station and straddles the boroughs of Tower Hamlets and Hackney. 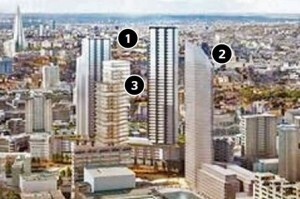 Its development will significantly impact on its surroundings and could create a hub that redefines the area. 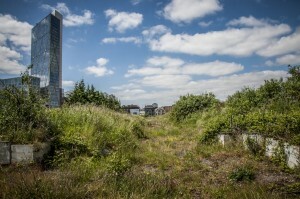 The planning guidance is considering bringing up to 2000 new homes and 1.8 hectares of public open space to a site that is currently a 10 acre derelict void in the middle of one of the most bustling areas of East London. 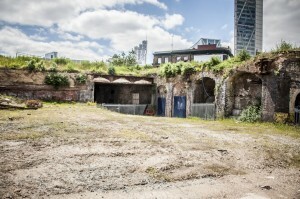 Since the project is in its early stages of planning, the Soundings Office, a local sounding board facilitating the dialogue between community liaison groups and developers Hammerson and Ballymore Group, has scheduled several events to get local residents and traders more involved in determining how the space will be utilised. Pop up Events in the area will allow for a free exchange of ideas and for locals to gain an insight into the plans for the development. Events include Ideas Week (17th-22nd June), which will see workshops set up in a marquee opposite Shoreditch High Street Station. To keep abreast of the development, and to join some of their upcoming events, contact the Soundings Office and become a part of the changing landscape of Shoreditch. 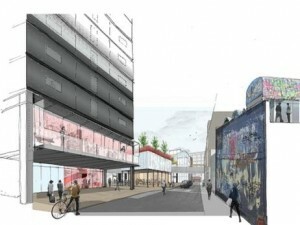 Grand plans to redevelop Shoreditch market have been submitted for consideration and could see redevelopment work start as early as next year. 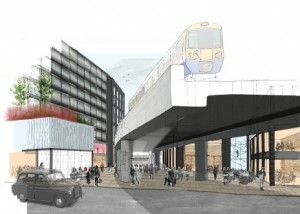 The development proposal, named “Shoreditch Village” is being headed by London veteran property developer Dominic White whose family purchased the site in the 1970s. Architects have worked closely with local councils which are said to be in full support of the project because of its allotment of more green and community space. 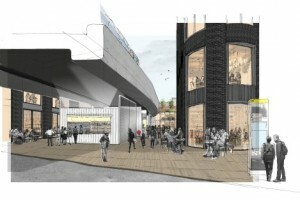 Looks like we should all keep our eyes on Shoreditch in 2014! 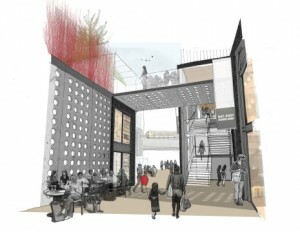 Retail Leasing agents acting for Shoreditch Village are RK RetailConsultancy. The City Road is being transformed into an unlikely “starchitect canyon” with four of the world’s top names, including Lord Foster and Sir Terry Farrell, designing towers there. Property experts said it was unprecedented in the capital for so many prominent architects to be working on projects so close to each other. The skyscrapers are being built along a 400-metre stretch of one of central London’s least glamorous roads. About £1 billion of investment will create a “mini-Manhattan” of towers in a new quarter around the City Road Basin on the Regent’s Canal. The first tower to offer flats for sale off-plan is the Canaletto building at 257 City Road where Knight Frank will be marketing studios from £500,000 and two-bed apartments from £810,000 at the launch this weekend. The 196-metre tower at the north end of City Road was designed by the Amsterdam-based UNStudio, which was responsible for the Scotts Towers in Singapore and the Mercedes-Benz museum in Stuttgart. Across the road from the Canaletto is the site for Berkeley’s City Forum complex at 250 City Road. It includes two towers and was designed by Foster + Partners, whose work includes the Gherkin, the Great Court at the British Museum and Wembley stadium. At 261 City Road, work has started on 36-storey tower The Lexicon, designed by US firm Skidmore, Owings & Merrill, which designed the Burj Khalifa in Dubai, the world’s tallest building, and the Nato headquarters in Brussels. Closer to the Old Street roundabout at 161 City Road is the art deco-inspired Eagle residential tower designed by Sir Terry’s practice. Bethnal Green starts only a few hundred yards east of the shiny, gleaming towers of the City and the arty cool of Shoreditch, but it is not long before the traveller down the Bethnal Green Road is transported to the bustling streets of Dhaka or Chittagong, and then with another shake of the kaleidoscope the journey ends in the Roman Road, where the heart of the old working-class East End still beats. Today, Bethnal Green is a place of noisy ethnic colour and contrasts. Close to Shoreditch, it is where the young and fashionable come to share flats as close to London’s hippest quarter as they can afford. Here, they live cheek by jowl with the capital’s largest Bangladeshi community. It is where house hunters looking for affordable homes snap up the two- and three-bedroom flats on council estates, or sniff out two- and three-bedroom Georgian and Victorian cottages in one of the charming conservation areas. Signs are, too, that life is looking up in Bethnal Green. Along Cambridge Heath Road, in what has been dubbed the “Civic Quarter”, the fine old baroque town hall building has been turned into a boutique hotel with Nuno Mendes’s restaurant Viajante, one of the capital’s most fêted new restaurant openings. On the same street the long-established outpost of the V&A, the Museum of Childhood, had a well-deserved facelift five years ago when architects Caruso St John designed a new façade and entrance lobby. Close by are Bethnal Green’s library, the Sir John Soane-designed St John’s Church — now undergoing repairs — and York Hall, a famous east London boxing venue which also has one of London’s few council-owned spas with Turkish baths, steam treatments and a sauna. Properties in Bethnal Green: the area offers a mix of Georgian houses along the main roads, warehouse conversions and ex-council flats. 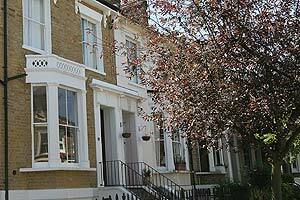 The real gems are found in the various conservation areas where there are two- and three- bedroom Victorian terrace houses and spacious converted flats in larger houses of the period. 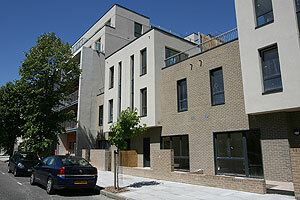 Bethnal Green is popular with young renters working in the creative industries based in Shoreditch and Hoxton. Bargain hunters and buy-to-let investors purchase the ex-council flats. Young professionals aim for the pockets of Victorian houses. This is a young person’s area; couples often move out to the suburbs once they have children. Postcode: E2 is the Bethnal Green postcode but it also includes Haggerston and parts of Shoreditch. Best streets: there are pretty, flat-fronted, straight-off-the-street cottages in the Jesus Hospital Estate conservation area around the Columbia Road Sunday morning flower market which sell for between £450,000 and £600,000. 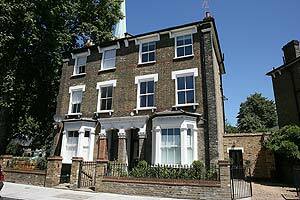 In the Globe Road conservation area, to the east of Cambridge Heath Road, there are small terrace houses in Cyprus Street and Gawber Street which sell for between £500,000 and £575,000 and much larger houses in Approach Road, although most of these are divided in to flats. The Old Bethnal Green Road conservation area contains the Denys Lasdun-designed Keeling Tower, which was sold by the council to a private developer in 1999, where flats sell for between £160,000 and £375,000. Nearby in the Winkley Estate there are three-storey terrace houses with workshops behind them where Bethnal Green’s furniture industry once thrived. Houses here sell for around £500,000. What’s new: the Silk Gardens in Parmiter Street, east of Cambridge Heath Road and close to the town hall building, is a development of 63 three-, four- and five-bedroom homes with roof gardens and allotments, available through housing association Family Mosaic ( 020 7089 6340 ). Prices start at £127,250 for a 25 per cent share of a flat with a market value of £509,000. Schools: Bethnal Green’s schools serve their local community well, even though many middle-class families choose not to stay in the area. Bonner primary school in Stainsbury Street is judged “outstanding” by the government’s education watchdog Ofsted. Globe in Gawber Street and St Elizabeth’s RC in Bonner Road are both “good with outstanding features”. The Gatehouse School in Sewardstone Road is a co-ed prep school for three to 11 year-olds. Oaklands School and Morpeth are two small co-ed comprehensive schools which are judged to be “outstanding”. Neither has a sixth form but the Cambridge Heath Sixth Form College opened in September last year and Lloyd’s of London is sponsoring three students a year, with grants of £3,000 a year towards their university tuition fees. What are known as “concept stores” reign at the Shoreditch end of Bethnal Green Road. A mini department store called 123 sells — among other things — clothes remade from vintage items; Type sells furniture and art; Labour and Wait is famous for its old-fashioned utilitarian-chic clothes and home accessories, and in nearby Cheshire Street — the Bethnal Green rather than the Shoreditch end — there is Beyond Retro, a huge warehouse and probably London’s largest selling vintage clothing. 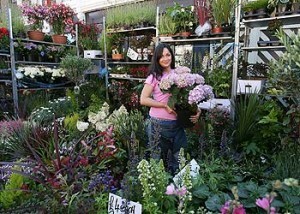 Columbia Road comes alive on Sunday when the flower market is one of the nicest places to go on a sunny morning. The shops which line the street are all independent. Worth seeking out are: Jones Dairy in Ezra Street, a deli and café; Campagnia Gastronomica, another deli and café but this time specialising in food from south-ern Italy; Treacle for English cakes, Café Columbia for that East End speciality — filled bagels. Ryan Town sells the work of paper cut-out artist Rob Ryan; Two Columbia Road is good for mid-century furniture; try B Southgate in Ezra Street for antique leather chairs, while Fred Bare sells hats from a rustic-chic interior. Long-standing retailer Idonia Van Der Bijl is good for gifts, while Angela Flanders is one of the capital’s best perfumers. Prick Your Finger is a charming knitting and crafts shop on interesting Globe Road. There is a large concentration of modern art galleries on Vyner Street and a good time to explore is on the first Thursday of the month when they stay open late. The Victorian splendour of Victoria Park is a short walk across the canal on the northern edge of Bethnal Green, while Mile End Park in Bow is a linear park alongside the canal which runs between Limehouse and Old Ford Road. Weavers Field is where the annual Baishaki Mela Bangladeshi festival is held every May. York Hall on Roman Road is the nearest council-owned swimming pool. 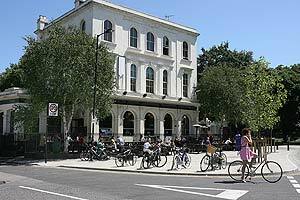 The Rich Mix on Bethnal Green Road is the local arts centre which puts on theatre, film, dance and poetry events. The Aubin cinema in Redchurch Street, Shoreditch is located in the Aubin & Wills fashion store in an old warehouse building. Located on the Central line, Bethnal Green is in Zone 2, one stop away from Liverpool Street, two stops from Bank and seven stops from Oxford Circus. Trains from Cambridge Heath and Bethnal Green railway stations take eight minutes and six minutes respectively to Liverpool Street. An annual travel card to Zone 1 costs £1,104. Council: the local authority is Tower Hamlets (Labour controlled); Band D council tax for the 2011/2012 year is £1,195.34.